Burns Night is a celebration of Robbie Burns, a famous Scottish poet who was born on the 25 January in Ayr, Scotland. Not only is it a very popular evening in Scotland it is also celebrated throughout the world. In the far and distant days when I wanted to impress my now husband I was invited to a Burns Night supper by his very Scottish parents. I had a little dread that haggis might be on the menu but stupidly thought there would be other options. Burns night really is all about the haggis and there are no other options. The haggis was piped in and then addressed before being stabbed with a dagger. So I sat at a very long dining room table and in front of me was a large plate with just the haggis, the neeps and the tatties. There was little escape. I thought of weakly saying I didn’t like it – and decided that would not go down well, I could try and hide it under the vegetables but that wasn’t really an option. The one and only option was to eat it, and I have never looked back – it is really delicious. It has a spicy, meaty taste to it. Haggis is made from the heart, lungs and liver of a sheep mixed with oats and spices and encased in a sheep’s stomach, not a description that has you reaching for your knife and fork. 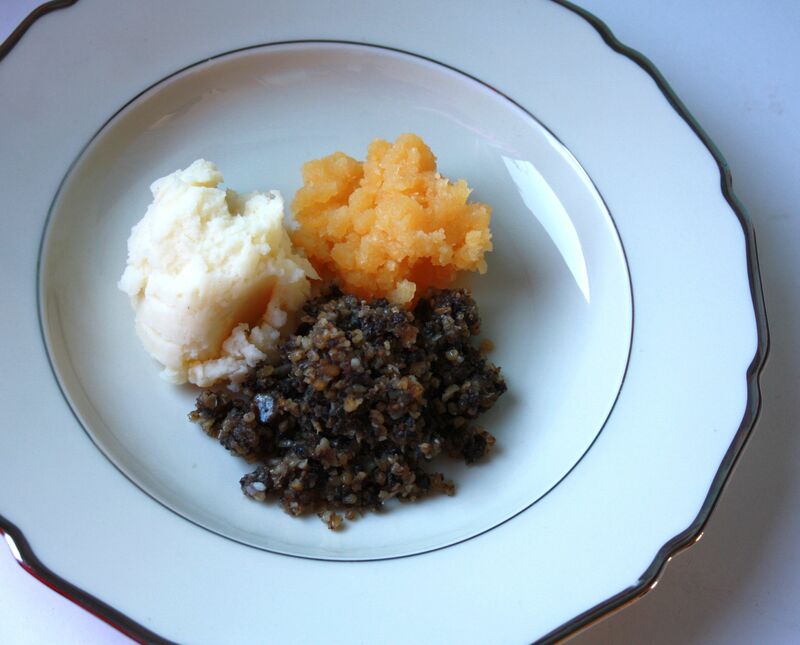 Every year we have celebrated Burns Night with a haggis, neeps and tatties. There have been a few disasters over the years, such as the time I absentmindly left the haggis unattended on the kitchen table and the dog ate the whole thing, metal clips and all (a trip to the vet and a nerve racking couple of days followed) and the year I had guests who I wanted to impress only to find when lifting the lid to the pan that the haggis had exploded while simmering, and the poor wee haggis had to be drained and served without an address or glimpse of the dagger. 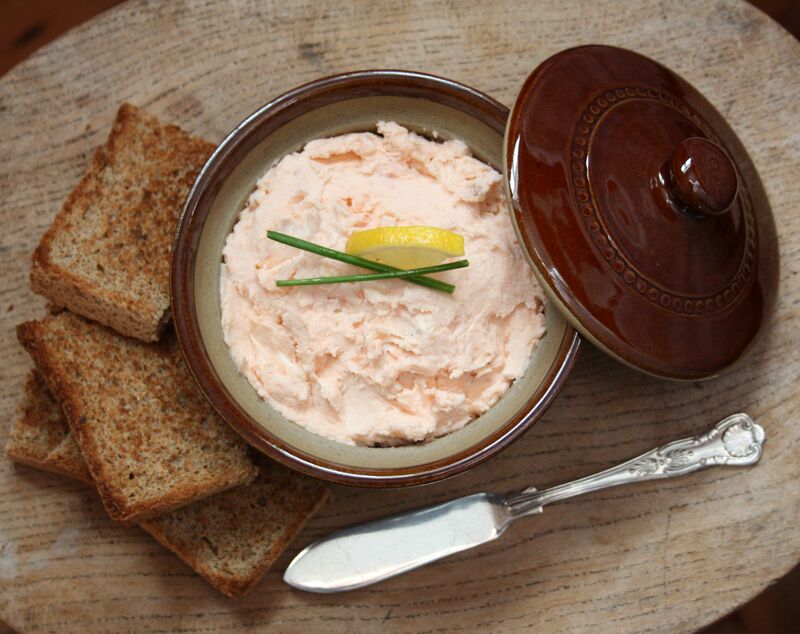 The haggis is quite a filling dish so salmon pâté makes for a good starter. It is incredibly easy to make and takes five minutes. If could be used as a filling for Gougères or served with toasted wholemeal bread. This recipe is not set in stone, you can put less smoked salmon in or more cream cheese. Smoked salmon has quite a delicate flavour and can be easily overpowered. Put the smoked salmon and cream cheese into a food processor and blitz for a minute, keep blitzing and checking until you have the consistency you want. Add a tablespoon of double cream, the juice of half a lemon and salt and pepper. Taste. If the pate is too thick loosen it with an extra spoon of double cream, or add more lemon juice. Place in a bowl cover with Clingfilm and put in the fridge. Serve with wholemeal toast and lemon quarters for those who like a little extra lemon. 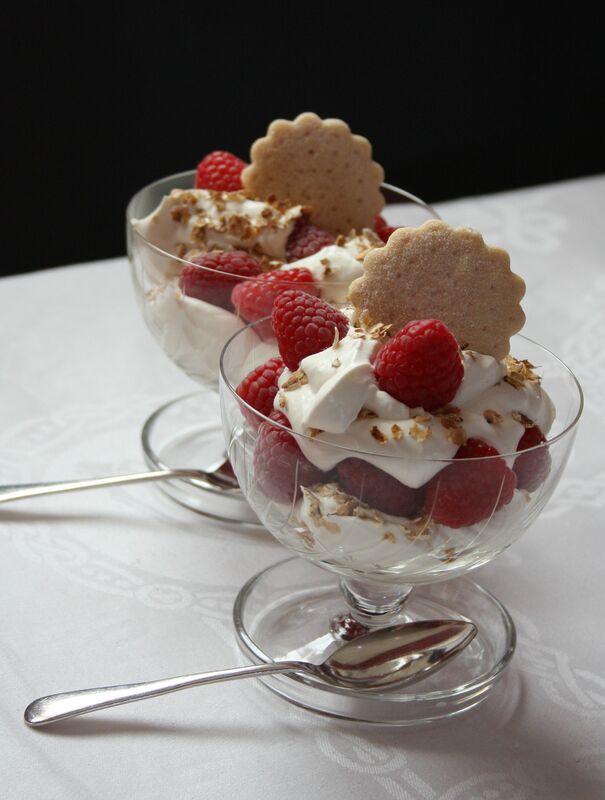 One of the traditions of the recipe of Cranachan is the adding of charms, very much like the Christmas pudding. The charms are mixed into the cream and served in a large bowl. Like Christmas pudding the enjoyment is finding one of the charms. Each of them has its own significance: a charm in the form of a ring signifies marriage; a coin – wealth; a wishbone – heart desire; and a horseshoe – good luck. The recipe below is really down to taste. The honey is there to sweeten the cream and it needs to be used with some care because it can be quite a strong taste. I have written 2 tablespoons of whisky but if you love whisky then put more in. Whip the double cream and cream cheese until soft peaks then add 1 tablespoon of whisky and 1 rounded tablespoon of honey, fold into the cream. At this point taste. Adding another tablespoon of whisky or even more if desired. Remember you can add but not take away! Place a non-stick frying pan on medium heat and add the oats, turning and tossing them so that they don’t catch. They are ready when they turn a golden brown, they can catch and burn very quickly so they need careful watching. Once golden brown set aside to cool. To make up the Cranachan put some of the raspberries into a bowl and cover with the whisky cream, sprinkle the toasted oats over this and repeat the process. Topping off with a couple of raspberries. Mix butter and caster sugar together with a mixer. Add both flours and salt. Draw together to form a dough. Turn out onto a floured worktop and roll out to about 1 cm thickness and cut into circles using a scone cutter or cut around a small saucer depending on what size you want. 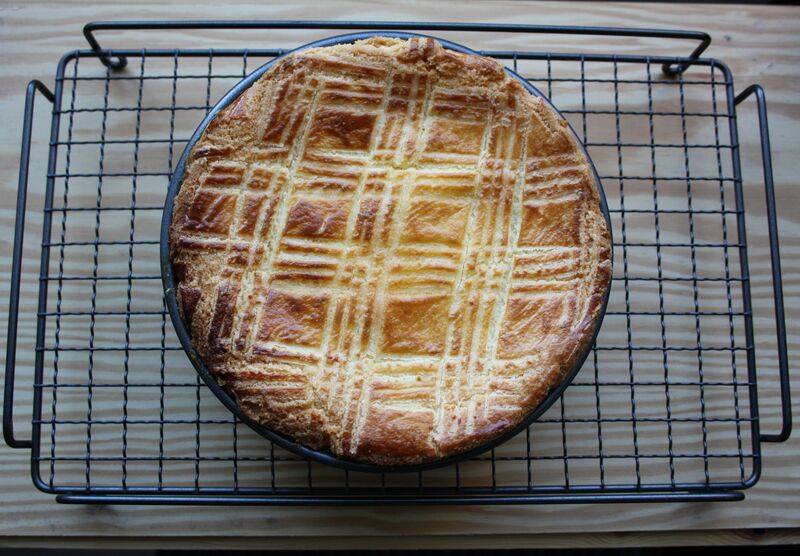 Place onto a baking tray lined with greaseproof paper. 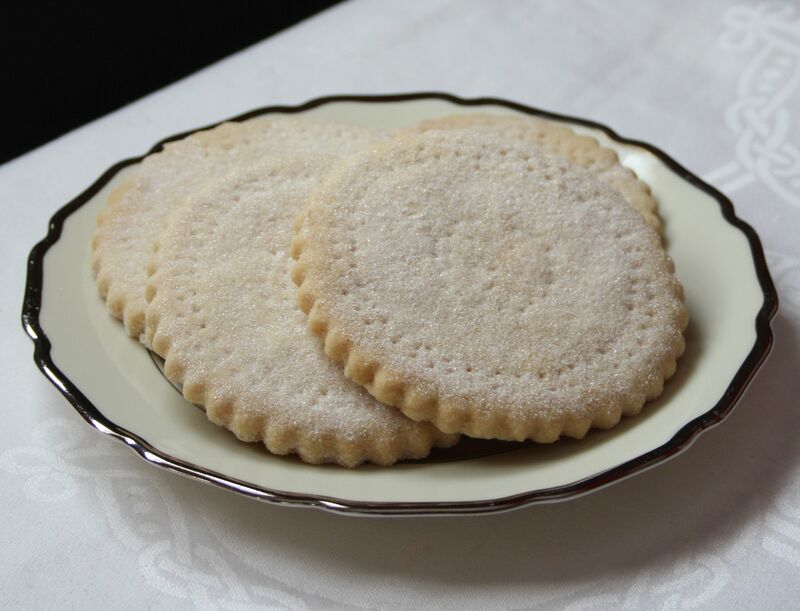 With a fork, make holes over the shortbread. This will enable the caster sugar to cling to them once baked. Put into the fridge and let rest for 15/30 minutes. Bake in the oven for 1 hour checking for the last ten minutes that the shortbread doesn’t catch or brown too much. They need to be a pale golden brown. Smaller biscuits will take less time. Carefully transfer to a wire rack being very careful, as while they are hot they are very fragile – they will brittle up as they cool. Once cooled sprinkle with caster sugar. Microwave – which means cutting the lining and put the contents into a bowl. The downside of this method is that you cannot bring the haggis to the table and ceremonially cut it open which is really all part of the dish. Cooks in 6 mins. Oven – Wrap the haggis in foil and place in a pan with an inch of water and place in the oven, 180C/Gas 4/350F for 1 hour. Remove the foil and serve. Boil – This is the method I prefer. I wrap the haggis in silver foil and tightly twist the ends and place into boiling water, the minute that it is placed in the water turn down and simmer for one hour, remove the foil and serve. Neeps are Swedes, peeled, diced and boiled in salted water for about 20/25 mins until soft. Drain and mash, adding a level spoon of sugar a little butter and some seasoning. Serve. Boil required about of peeled potatoes in a pan with salted water. Boil for 20/25 mins until soft. Drain and leave in the sieve for a minute or two for the steam to evaporate. Using a potato ricer mash the potatoes. Add to this a generous piece of butter and stir, the potatoes should still be quite firm – to loosen them add a little milk. Season and serve. I used to make this tea bread without thinking, well, maybe a little bit of thinking was involved but it was a really easy recipe to make, we had it so often it became ordinary and unexciting so I stopped making it and the recipe was forgotten in a drawer and left to gather dust. When I was going through the kitchen drawer this week I found my little paperback notebook – it is scribbled on and worn but inside is a world of lost recipes carefully handwritten some twenty five years ago. Some of the recipes are just scraps of paper with recipes written on which have been glued in and others are tinted with stains of food long eaten. I can remember a time when I was lost without this little book, it held my culinary world in its grasp. All the recipes in that little note-book were collected from friends and family, their mothers and grandmothers – some of them were not that easy to obtain and one or two of them I suspect are not complete, they are missing that little extra ingredient, having the reputation of making the best lemon cake in the village was something to aspire to – you weren’t going to throw that away lightly. When I was a small child, I often overheard many times ‘she makes the most marvelous sausage rolls, but she won’t give the recipe away’ to a gaggle of disapproval and an intake of breaths. How times have changed; a computer and access to the internet reveals all. Mix flour, baking powder, salt and mustard in a large bowl. Add butter and rub it in between your fingers until it resembles fine breadcrumbs (being lazy I put it in the food processor and whizzed for about a minute). Stir in cheese and walnuts and then mix in milk and egg to make a soft dough. Turn the dough into the loaf tin, level the surface and make a slight hollow in the centre. Bake for 40-45 mins till golden brown. (I baked mine for 50 mins which I believe is down to my oven). Take out and cool. When cool slice. My preferred way of eating this is to spread a thick slice liberally with butter. This isn’t a moist tea bread. 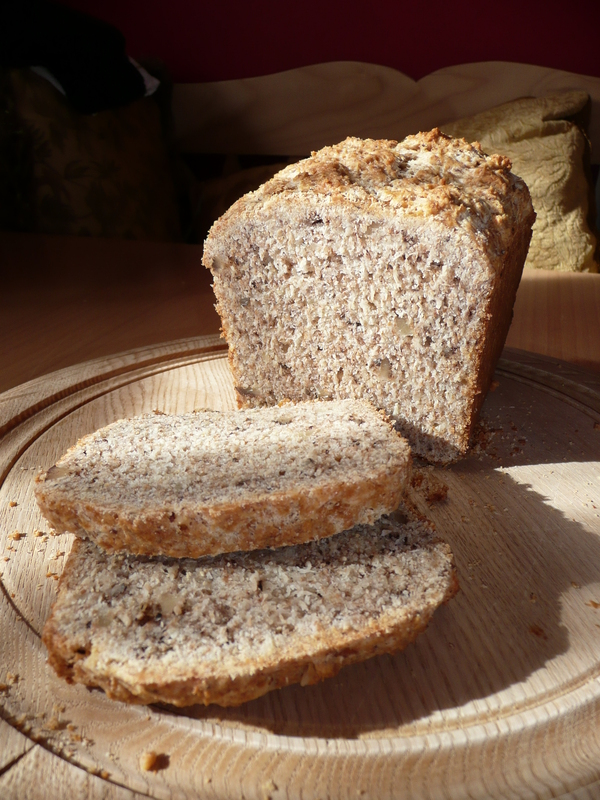 It has a more wholemeal texture, but the smell and taste is lovely and morish. In my house we tend to go through cooking phases of loving a particular recipe, be it cake, a pasta dish or a way I cook the vegetables. Then all of a sudden I will not want to eat it again. This can last for months if not years. The poor coffee and walnut sponge cake has been victim to one of these phases. It was when I was trying to build up some inspiration by looking at my larder shelves of what to bake when I saw a packet of walnuts. I realised I haven’t baked a coffee and walnut cake for ages. 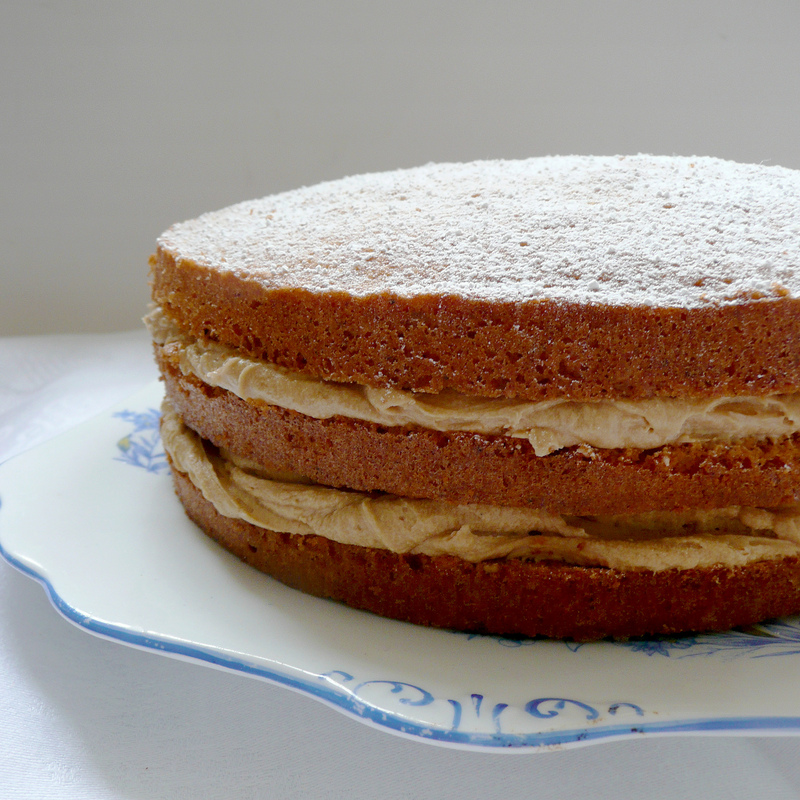 When I was a child and taken out for afternoon tea the coffee and walnut cake was an indulgence, the height of sophistication and the only way I was ever going to get a taste of coffee. There were some very strict and strange rules when I was growing up and one of them was that I was not allowed to drink coffee, not until I reached the age of 18. I don’t know the reason, and I never asked but the thought of having the forbidden coffee and walnut cake every now and then was enough to keep me quiet. Turn oven to 350F/180C or Gas Mark 4. Whisk the butter and sugar until pale in colour. Add the eggs a little at a time. If the mixture begins to curdle add a tablespoon of the weighed flour. Fold the chopped walnuts into the mixture. 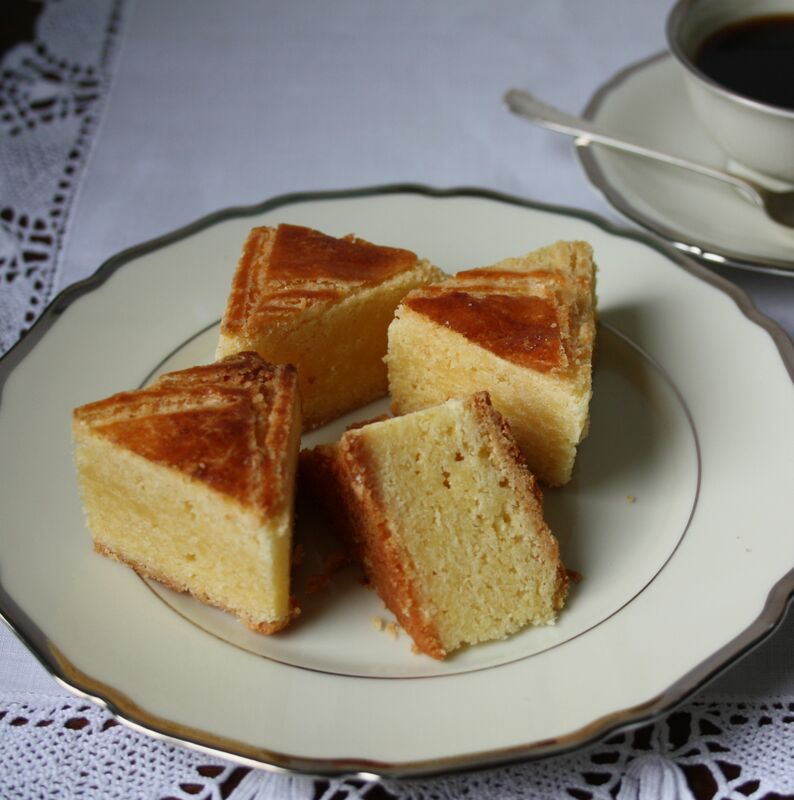 Transfer into three cake tins (or two tins if you want just a two layer sponge cake) and bake in the centre of the oven for 25/30 mins until risen and sponge has just left the sides of the cake tin. A final test would be to gently push your finger into the middle of the cake, if it springs back it’s done. Leave in the tin for a few minutes and then turn out onto a wire rack to cool with the top of the cake facing upwards. Otherwise as the cake cools the wire rack will leave an impression on the sponges. Mix the coffee with the milk and stir until it has dissolved. In a bowl add all the ingredients and blend with a food mixer on the slowest speed to begin with otherwise there will be icing sugar everywhere. As the mixture starts to blend turn the speed up and continue mixing until you have a smooth thick cream. Make a decision as to which sponge has the best looking top, save this for the top layer. If one of the cakes has broken, don’t worry use it for the bottom layer. 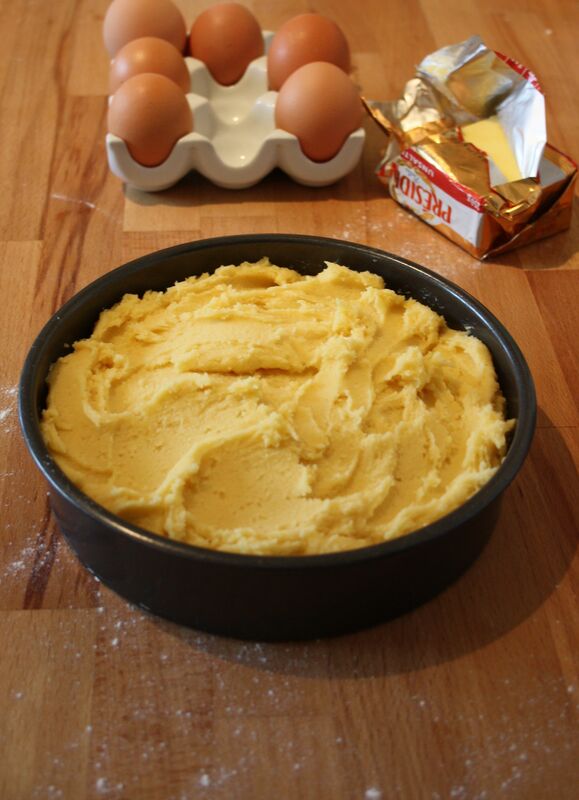 Divide the butter cream in half, spreading the bottom sponge layer with one half and then placing second sponge on top. Spread the remaining buttercream and top with last layer and dust with icing sugar and store in an airtight tin. Soup to me never looks appealing – it’s all in the taste. Celery and Stilton are not two ingredients I would rush to eat on their own but together they go very well. This is often a soup I make after Christmas as there is always a piece of Stilton left in the back of the fridge which I am not going to eat on a cracker and I am too mean to throw out. My father was a huge fan of Stilton. Whenever he came to stay he would ask if there were any moldy bits of cake or Stilton lurking anywhere? If so he would be only too happy to finish them off for me as a favour – no gain whatsoever for him. He also had the same selfless attitude to any open bottles of spirits. I always did have both, something we both knew I would have and neither of which were ever moldy. His favourite way of dispatching the Stilton would be to toast a French Stick sliced in half and then covered with slices of Stilton which were then placed under the grill until bubbly. This soup made a near perfect lunch for him as long as there was a generous slice of fruit cake to follow. Trim, wash celery and chop finely. Melt butter in a saucepan. Add celery and onion and leave to sweat with the lid on for ten minutes. Stir a couple of times just to check that nothing sticks to the bottom of the pan. Once vegetables have softened add 850ml/1 ½ pt vegetable stock, stir and replace lid and simmer gently for 30 minutes. Check that the vegetables have cooked. To test, push a piece of celery against the side of the pan and it should crumble. At this point you could add salt and pepper but I prefer to season after I have added the Stilton. Liquidise while still hot. At this point you have a choice, either to leave it as a celery and onion soup which tastes good or to add the Stilton which will change the flavour totally. If adding the Stilton there is no fixed measure to add, just the left over bits in the fridge will transform the soup. About 85g/3oz is just about enough for me. Crumble the Stilton as you add it to the hot soup and stir, it will melt with the heat. Taste and season if required. If re-heating do not boil but bring slowly to a gentle simmer. It is ready to serve. Cream for decoration can be added at this point. Slice the French bread into 1 cm slices. Any thicker and you lose the toasted crispness. Toast the French bread on both sides. Slice some Stilton and place on top of the slices and put back under the grill, it will only take a few minutes for the Stilton to melt. Place on top of the soup and serve.